In 2000, Sheila Hugh Mackay offered to donate a piece of work by each of the first five winners of the Strathbutler Award to the New Brunswick Museum. 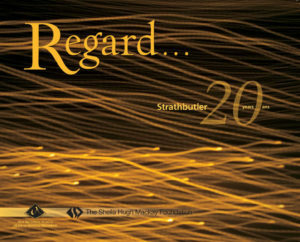 Each year, since 1991, a jury of artists and critics chose from among qualified nominees, one recipient of the prestigious Strathbutler Award. Presented by the Sheila Hugh Mackay Foundation, Inc., the award recognizes artists or craftspersons who have achieved excellence and has made significant contributions in their field of endeavour. As such, this award symbolizes the respect and approbation of peers and critics. Her gesture, the Sheila Hugh Mackay Collection of Strathbutler Award Winners would ensure that a permanent document in a public collection would record the concerns, talents and abilities of each of the award recipients. It had been Sheila’s wish to continue to develop the collection over time and to support the NBM’s programmes relating to contemporary art and craft. Unfortunately, her untimely death in September 2004 seemed to have put an end to that ambitious project. Always prepared though, she had made provisions in her will and her bequest of 110 pieces of contemporary visual art has been one of the most important and most substantial additions ever made to the NBM. In late 2006, the Sheila Hugh Mackay Foundation, Inc., as an extension of Sheila’s generosity, offered to assist to the NBM in continuing to build the collection of the work of recipients of the Strathbutler Award. Funding to acquire these works was also provided by the Canada Council for the Arts Acquisition Assistance Program which supports institutions with professional curatorial staff who have, for a minimum of five years, demonstrated a commitment to the displaying and maintaining of a contemporary Canadian art collection. In addition to being a legacy of objects, the Sheila Hugh Mackay Collection of Strathbutler Award Winners also documents a philanthropic gesture that is having a profound effect on contemporary New Brunswick art. The Sheila Hugh Mackay Foundation, Inc.’s continuance its founder’s initiative affirms a strong belief in culture’s essential value. This powerful statement of encouragement is positively affecting the professionalism of our artists and craftspeople and is significantly promoting an increased awareness of contemporary art.